White Bridge Farm - Wolseley Accommodation. Our bouquet of accommodation is situated on a working fruit farm, on the banks of the Breede River. We are surrounded by breathtaking mountain and orchard views. The popular river cabins "Dixon's View" and "Otter's Landing" (sleeps 2/4) are all nestled amongst the orchards adjacent to the river on White Bridge Farm. We also have Whiskey Yankee Cottage (sleeps 4/5), also on the banks of the river but close to the Olive Rock Wedding and Function Venue and even closer is the Annex unit (4/6 sleeper). We also have two double guest rooms, bathroom en suite situated close to the main homestead on the premises. We are a mere 90 minute drive from Cape Town - approachable through various beautiful mountain pass drives. Whilst here, enjoy wading in the crystal clear river pools or a game of tennis on our garden court (at the main house). There are fantastic walks on the farm and excellent hiking in the surrounding mountains. Bird watching is brilliant and fishing exceptional!!! We are very well placed to visit the towns of Wolseley, Tulbagh and Ceres and experience the jewels that these towns have to offer. For golfers there is a great little course in Ceres 10 Km away and the exciting new Zipline Adventures ( longest Zip slide in Africa) for those who are not. Tulbagh has some wonderful boutique wines, art and a wonderful theatre. There is a challenging mountain bike ride near Wolseley which formed part of the 2010 and 2011 Cape Epic. BELOW ARE THE VARIOUS ROUTES TO WHITE BRIDGE FARM FROM CAPE TOWN. NB: None of the routes take you through Wolseley town. You bypass either way. Take the N1 north and at Klapmuts /Stellenbosch off ramp turn left onto the R44 to Wellington. Continue until you arrive in Wellington and you go left and right and find yourself in the main street. Follow the will come to a T junction. Here you turn left, following the signs to Ceres. Continue until you see the brown tourism sign which reads White Bridge S/C and Olive Rock wedding and function venue which is situated at the Ceres 10 Km sign. Here you turn left and keeping left then right, and you follow the signs to our house and get instructions from there. Follow route 1 as far as Wellington. Before you enter Wellington, you keep left on the R44 marked Ceres. You stay on this road and it winds through the Swartland and then through Nuwekloof pass. Continue along this road towards Ceres. You bypass the two entrances to Wolseley and just before you start the final climb to Ceres, you will find the R43 and R301 to Worcester to your right and you immediately cross the river. After another few hundred meters you will see the brown tourism sign which reads White Bridge S/C and Olive Rock wedding and function venue to the right. Once you have turned, keep left then right and you follow the signs to our house and get further instructions from there. NB: The Slanghoek route should not be taken after recent heavy rains as you could be caught by a flooding river. Take the N1 north and continue through the Hugenot's tunnel. On the far side of the Du Toits Kloof Pass, you will turn right at the first opportunity. The sign is marked Rawsonville. You will continue for about 3 or 4 Km (not measured - an estimate) and you will see a crossroads. Here you turn left to Slanghoek and Goudini Spa. 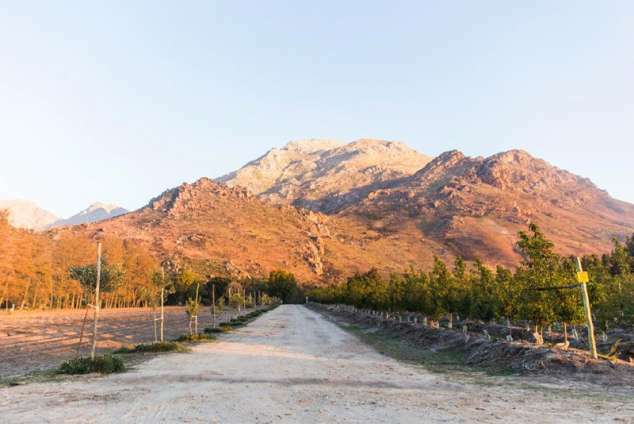 Continue on this road through the Slanghoek Valley past the Slanghoek Winery and you will cross the Breede River. Shortly after crossing the river, you will come to a T Junction, where you will turn left. Continue on this road, following the signs to Ceres. Look for a brown tourism sign which reads White Bridge S/C and Olive Rock wedding and function venue which is situated at the Ceres 10 Km sign. Here you turn left and keeping left then right, and you follow the signs to our house and get instructions from there. ROUTE 3A: VIA HUGENOTS TUNNEL/DU TOITS PASS AND GOUDINI WEG. Follow the above instructions as far as the Slanghoek turn off. Here you do not turn left, but continue another km or two and turn left at the next cross roads marked Goudini Weg. You will cross over the top of the N1 and come to a T junction and turn right. After about 5 Km, you come to a T junction and you turn left, following the signs to Ceres. Continue along this road, following the signs to Ceres. Look for a brown tourism sign which reads White Bridge S/C and Olive Rock wedding and function venue which is situated at the Ceres 10 Km sign. Here you turn left and keeping left then right, and you follow the signs to our house and get instructions from there. Detail description : We are situated on the same premises as the very beautiful and popular Olive Rock, wedding and function venue - see www.oliverock.co.za and we also have our own in house marimba band on request. See www.amawolseleymarimbas.co.za. For the rail enthiuasts you can see the newly refurbished steam train running from Ceres to Wolseley from your venue. See wwww.ceresrail.co.za. Furthermore we are only 10 km from the longest zipline adventure in Africa - see www.ceresadventures.co.za . We are fast becoming a very popular birding destination and many of these endemic birds can be viewed from your accommodation. See www.westerncapebirding.co.za for details of routes in the area. 18303 page views since 30 Nov, 2009. Last updated on 19 Mar, 2019.